This section focuses on what can be learned from Population Health Age-Gender metrics, for application to the development of more effective quality of care metrics targeting special needs and low SES populations and practices sensitive to cultural health needs. An effective way to integrate qualitative research methods into quantitative methods is to use qualitative analytics to answer those questions that could never be easily answered using just the quantitative approach. When the HEDIS/NCQA methods for evaluating population health were written up, the instructions seemed unclear at times about what purpose qualitative research techniques served. The reason qualitative research tends to be employed in these studies is in order to make sense of the intervention programs that exist and to determine how they can be improved in order to improve you overall results. However, qualitative research has more potential that those produced through just these applications. Generally speaking, you engage in qualitative reviews whenever you try to determine the barriers that exist to a particular health improvement process. This takes place whenever you review why patients don’t respond to your intervention letters, or come over for the weekly gathering and social designed for them to answer a new survey that you designed and implemented, or when you send to your PCPs a 7 question post-card or email survey asking them how they felt about the new program put in place to warn them of late immunizations or failures to return for follow-up biopsies. In the care setting, focus groups are sometimes employed using patients. When these focus groups are well planned, and the proposal is put through an official review of patient rights and inclusion/exclusion of cultural sensitive content, a review of these results deserves more than just a passing line or two in the final report and methodology sections. Currently, it is not the protocol for PIP/QIA reports to include an official series of metrics be reported focused on the results of a qualitative research method for these activities, but with time it is hoped that the agencies in charge of designing these programs and updating their recommendations will begin to recommended some sort of grounded theory method be administered for at least one of the annually required programs administered by QI departments. Focus group work has more applications with the potential for serving multiple purposes. Current focus group work is done mostly for meeting administrative, marketing and sometimes recertification needs. Like the CAHPS survey, JCAHO, and HIPAA evaluations, there are numerous potential for more fully applying qualitative research protocols to quality improvement programs. The reasons this is not currently the case may related to the traditional expectations of medical research in general. People and professionals feel more comfortable engaging in quantitative research methods, even to the point of trying to apply them to programs that never benefit from such applications. In general, at least according to most programs focused on the teaching of qualitative research methods, statisticians are not trained enough in the value of such techniques as Ethnograph, NUDIST or ATLAS/TI, and without that experience or knowledge base will probably not produce too many effective Focus Group and Case Study qualitative research projects. The implementation of a grounded theory approach at least brings their skills to use in a way that covers the same ground as these prior methods and yet is more widely accepted by academicians and practitioners in medicine in general. By adding qualitative research programs to a typical year round series of QI projects, we also add to out methods new way to utilize our quantitative reviews. This combined method enables us to better design new programs, with personal health care related issues, complaints, and settings in mind, for any and all programs out there in need of such change or improvement. You can also use qualitative methods of analyses, such as case studies and focus groups, to better define your barriers to certain clinical and lab services, and to pharmaceutical use and behaviors, in order to determine how to make your patients more responsible and willing to engage in services better because they are more affordable or more desirable. In the following figure 16 disease types are depicted that were noted in passing during a review of your annual report. These captured your attention the most due to the related local history of these events. Some of these conditions you know are linked to poverty, others to cultural background and upbringing, other to styles of living, and yet others for ecological or biological reasons. You goal thus becomes to produce several intervention programs and measures targeting two of the most needy of your special needs groups: low income communities and recently immigrated hispanic rural settings. Which 2 or 3 are mostly physical or anatomical-physiological in nature, with little opportunities for additional intervention by way of most traditional qualitative methods . . . for male? for female? Which 2 or 3 are mostly or nearly completely psychological or behavioral in nature, suggesting qualitative reviews could play an important role in improving long term outcomes for these individuals . . . for male? for female? Which 2 or 3 are most linked to place of living and poverty? Which 2 or 3 might respond best to education related interventions? Which 2 or 3 relate most to long term monitoring needs for the improvement of quality of life in the older years? Which of the above are specific to old age (55+)? Which one of the above is the most gender specific for male? for female? Which have the most cost attached to them in terms of ageing, reduced quality of life, and cost for care? Which is most preventable through simple screening? Try to define 2 or 3 qualitative and 2 or 3 quantitative metrics for each of the 16 ICDs. Those which are easiest to produce a list of by utilizing lab test results, yes and no queries of just electronic medical records, and other standard clinical activity results or intervention practices tend to be quantitative in nature. Next, a Likert scale metric is developed which you call the Combined Qualitative-Quantitative Research Methods Score. Try assigning a Likert value to each of the above 16. Now, pick 2 or three and develop an intervention program for evaluating overall program performance at the socioeconomic/cultural level in order to quantify the amount of improvements your program can generate on these particular health care services. One of the advantages to qualitative reviews is the ability for programs to more accurately target an intervention process. There are a number of discrete age differences between men and women in certain diseases or diagnoses. Conditions such as fibromyalgia have obvious gender specificity, whereas others like migraine and IBS demonstrate slightly greater tendencies for women to be diagnosed with the condition than men. The same is true for Crohn’s Disease, although the diagnosis is more gender specific from about 45 yo on. Likewise, for men alcohol related degenerative disease states such as alcoholic cardiomyopathy demonstrate a recurring mid to older age peak pattern, with a much greater number of cases than women. This relates as well to liver degenerative diseases, in turn requiring organ replacement. Men and women demonstrate different peak ages and multiple peaks placed differently for circadian sleep disorder. For the Circadian Sleep Disorder study, define two or three age bands, and compare male versus female participants with regard to their sleep disorder experiences. Make use of the Likert Scale technique. Produce a survey with questions that will help provide insights into age-related response patterns. One set of questions should target younger age group, another the medium age group and the third a much older group. We can use qualitative research techniques to strengthen our arguments about our findings. It is unimaginative to engage in a research project about people and never include people in that process. Yet this is exactly what we do everyday when trying to better understanding people’s health and population health. The much older experimental versus empirical approach argument to researching health still exists in the more modern medical world as well to some extent. The least personal approaches to studying your population are those used every day by analysts searching the data for impacts on costs, financial losses, reductions in overall worth, or loss of membership. Whenever we research a program in this way, and never engage the individual, we further the separtion that exists between people and attempts being made to improve the services offered to them. A lot of this third party type of viewing of the masses has been reduced by the addition of surveying and focus group ideas to the research process. Other techniques used for including actual consumers have included telephone interviewing, email based contacts for survey participation, occasional public meetings with refreshments and experts from all fields there to discuss the programs being offered, and the development of special interest groups like liaison groups and “mentor” like services in which other workers or patients serve to act as your coach or advocate when times get tough and you still want quit smoking, deal with your seizure problem correctly, or be able to socialize without fear that your health might get in the way of your “progress” socially. Researchers in the health care system it seems sometimes have this obligation to try to involve themselves a little more in the actual processes of providing, billing for, and responding to health care wants and needs. Health care is different than buying a car or going to the neighborhood barbecue in that when you are a consumer, your product and its continued used once the program is over is top priority. This means that your personal wants and needs are important to how successful any programs you engage in are, and how much they are worth to you. One step up above that researcher’s position in this process is the management-decision making level of being a grant provider. As a grant provider you are approached many times about the same sort of issues, matters, manners of trying to analyze health and people, ways to improve your local community, and ways to better population health as a whole. For this exercise in methodologies and how to produce the strongest types of outcomes quantitatively in order to produce the best health improving programs qualitatively, you are asked to imagine yourself to be the individual on that internal funding committee or some sort of grant providing agency with lots of money to spend, search for the best ways to spend it. The types of choices you have to make are who or what kinds of people are going to receive the benefits of your decisions, what kinds of ailments diseases or other quality of life matters will be addressed by those programs you support, how much of an impact will the programs you choose to support have on the local population and its economy. 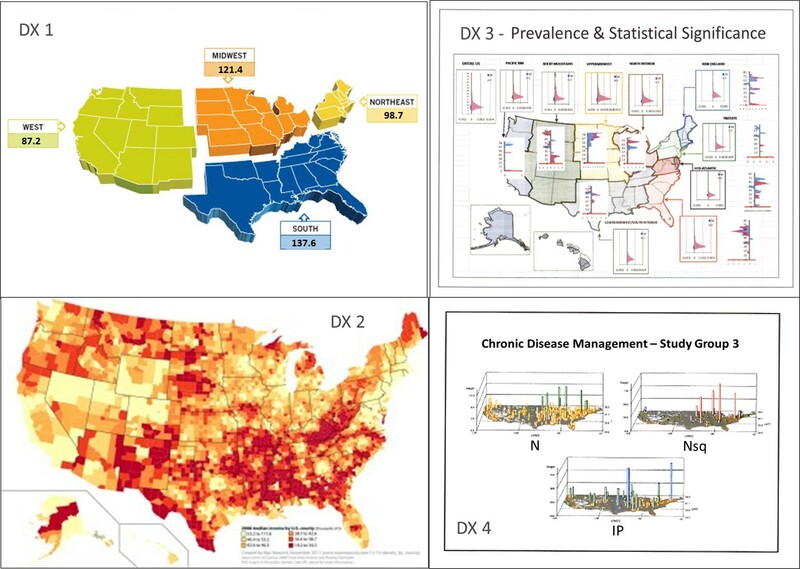 The following maps depict how disease and health may be portrayed and represent four of the innumerable ways of looking at population based medical issues with the goal of improving people’s health and having the best, most successful, most targeted impact. Diagnoses/Diseases 1, 2, 3 and 4 proposed for research. All involve children and life long impacts on quality of life for those children, and probably their immediate family and contacts. Four disease types are represented by the writers of these grants, and all have demonstrated the thoroughness needed to prove to you their work will probably be highly successful. The questions you are left to deal with relate to their background information and how they opt to engage in a combined qualitative-quantitative program in order to have the greatest impact on health, producing the most effective interventions. Knowing your targets for your plans tells someone where you’ll begin your ventures in population health change. How localized are the approaches going to be if the above maps were used to design programs that are different for each of the major regions described in the great proposal? Which disease related interventions might be best approached using a mass media program? In your grant you state that you plan to set up four central offices. Which maps best define where those offices might be set up? Which indicate the degree of lack of coverage that could result from maintaining such few offices? Which of the above maps indicates you have the best ability to target and diversify your intervention programs and techniques, such as by choosing where to spend your money and whether cost or prevalence, or both, might be the primary concern for you to focus upon? If the disease were an infectious disease, which of the above maps might you want to see? What if it were a psychological behavior or condition in need of treatment? a preventive care process such as willingness to visit your doctor once a year for your diagnosis? Which programs tell you that more work is required to determine where to begin your intervention process? Which single project shows you that the team which made this proposal knows exactly where to begin their intervention process in terms of place? in terms of age? For each of the maps, pick one place to place the office that would be in charge of your intervention program. Which of these do you think might require more than one office? based upon which criteria? Which of the above proposals define a project that will be hardest to select a starting place for? Which of these imply that you must return to the journals to determine exactly where to begin? Which of the above four methods of illustrating data might be best for studying and then impacting a culturally- or socially-important disease state such as a disease linked to a specific ethnic group, a form of child abuse, or lack of sufficient affordable care due to poverty. For conditions in which ruralness versus urbanness make the difference, which maps serve best for your project? Which maps best depict international border behaviors? rural poverty problems or conditions? environmental health issues? If the conditions you were researching had mostly to do with weather and climate impacts, which map(s) might be enough to suffice? For developing your focus group or case studies projects, you have to find participants. Because the maps are so different, different processes are required for each one. Which map is the easiest to use, be able to target your selections with, and then develop a focus group/case study plan with? Which one probably requires sampling to define places due to the wide dispersal of high risk results linked to the presentation method? Which one requires the most amount of work to define a place, and therefore offers very little opportunity for targeting your work and your results? If and when you choose to more selectively target your patients by adding more offices and programs to the network out there, which way of arguing this addition to your grant-funded program is going to best make that point? Which maps would you want to see for conditions that you know are impacted by income? by population density? by migration patterns? Which map best depicts outcomes that you would want to use to demonstrate the impacts your work had on masses of people and the places they reside? If your were to define the project’s worthiness by the amount of specificity of its plan, which one has made the most effort to use a map to define whom to target? where to target? where the most manpower is needed? List the above maps in descending order, beginning with the most actionable to the least actionable with regard to targeting and impacting your population.